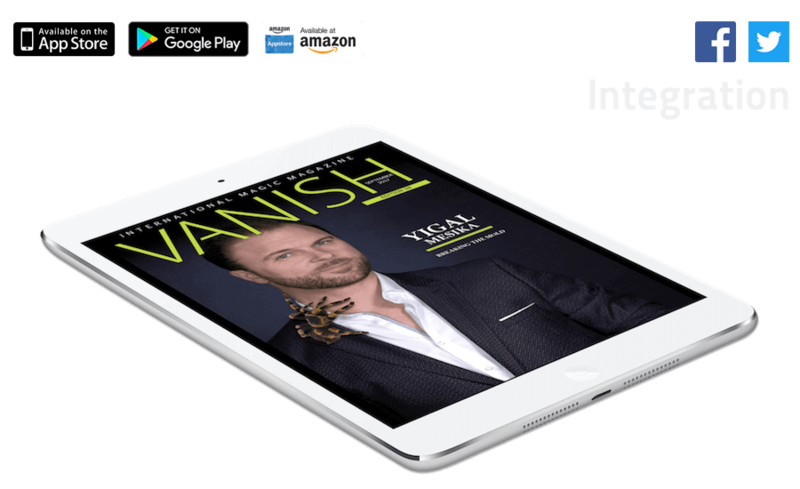 Get interactive magazine apps utilizing your PDF files. Distribute your content on mobile. Monetize smarter. Scroll down to see what we can do for you. You will use our web-based panel to manage everything about your magazine app. Here are some of the features you will use most often. We accept all sizes and resolutions of your PDF files. Simply export PDF from your favorite DTP app and upload it to PressPad. Access your PressPad account from any computer or mobile device. Upload your PDF and have it ready to distribute over your mobile magazine app in seconds. When you upload an issue we automatically generate a sample for it. You can also upload your own sample if you like. Replace your original cover with a .jpg file even if your magazine has been published. Send the Push Notification to build awarenes, or whenever you need to connect with your readers. Watch in real time as your issues are downloaded and bought. Download detailed sales reports in CSV format to import into your accounting tool. As your apps are installed by users from all around the world you may worry it's going to cost you a fortune. No, it is not! At PressPad we believe in publishers' success being our success. Publish as many PDF files as you need without limitations of pages quantity. We encourage our clients to upload their whole archive to PressPad. Whether you publish 300-page photo catalogue or 16 page fan zine about X-Men you can upload your PDF file to PressPad without any problems. Unlike our competitors, at PressPad we want you to have milion of downloads, because it usually means your magazine sell well, and this should be our main focus. PressPad does not require you to set up a developer account with Amazon. We handle that for you. PressPad does not require you to set up developer accounts neither with Apple nor Amazon. We handle that for you. Apple and Google require you to use own developer account to be able to publish on Apple App Store and Google Play. If you don't have one, do not worry, we'll provide a setup by step instruction, and if necessary we'll guide you during the phone call. Want to hide our branding and build your solid mobile presence without a middleman? Just let us know and we'll make it for you. Our magazine apps are available in many languages: English, Japanese, Polish, Spanish, Portuguese, German and Arabic. Let us know if you can't see your language. 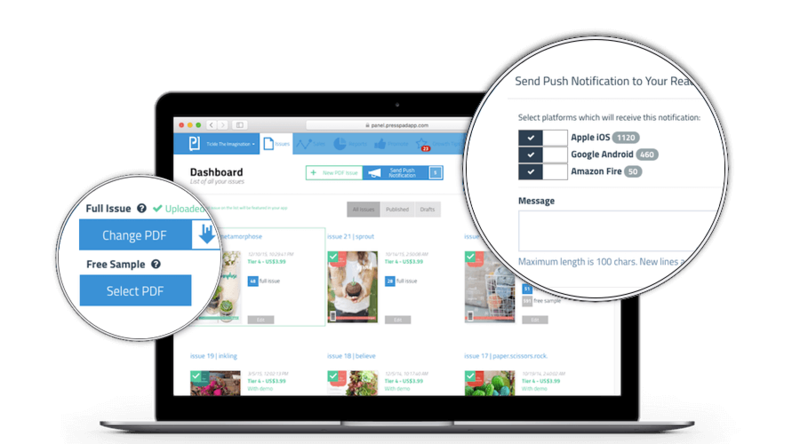 Use PressPad and you will take your magazine to Apple App Store, Google Play, and Amazon Appstore faster than you're thinking. Your readers will download your magazine app to their devices and use it to read your content anywhere they are. Here are some of the features your app will have. Your apps from PressPad will be 100% native code on both Apple iOS and Google Android. This means speed, reliability, and great user experience. Readers using any of iOS powered devices are be able to download and use your apps. There is more than 1 billion Android devices worldwide and your app from PressPad supports 88% of them. Amazon App Store for Kindle fire is the leading distributor of apps dedicated for the Kindle fire family. 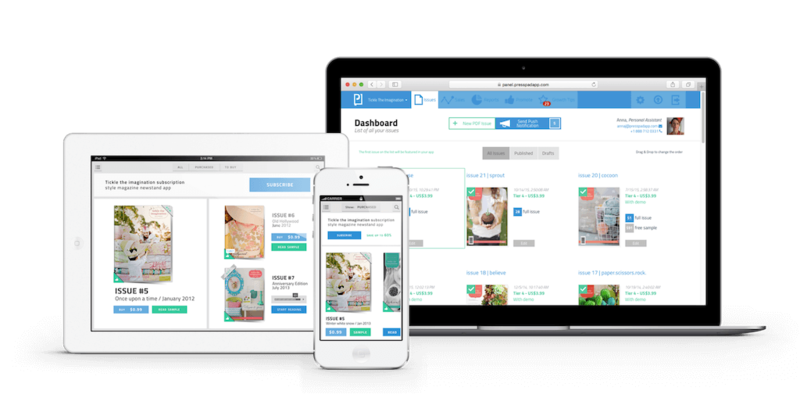 Your every issue on users' devices will look 1:1 the same thanks to PDF format. When user taps on YouTube or Vimeo link in your issue video player will show up and plays this link right away. PressPad supports hyperlinks in your PDF file. Create internal and external hyperlinks to provide better experience to your readers. We follow industry standards for user experience and use common navigation schemes. Every issue is downloaded to user's device for her convenience. We fetch your Facebook and Twitter posts and displays them within your app sidebar. This brings your readers closer to what's important or new. It's often overlooked but app size does matter. Your app from PressPad will be light on users' bandwidth with size of less than 7MB. In our journey to help publishers transition to mobile apps, we realized you probably can use some help in promoting your mobile app. Here are the most popular features that our clients use to create their digital distribution channels and increase their brand recognition. Sell through you own website. Readers are able to pay with PayPal or credit card and read your content on their iOS or Android devices. Sell mobile issues directly through your Facebook fanpage. Display automatically updating ad for your mobile magazine. Tell your website visitors that you have a mobile app in a smart way. At PressPad we published hundreds of magazine apps – let us fine tune your listing. Engage readers with custom messages reminding them of your app. Publicly available free ebooks and the blog about digital publishing and ways to increase your mobile sales. With each PressPad account comes complimentary technical support for you AND your readers. Test it before you pay for it. Risk-free and ease of use are our priorities.